GAMMA - the Gerry Anderson Model Makers Alliance - is an informal group of people who are interested in computer modelling of craft and other objects from the productions of Gerry Anderson. The alliance is dedicated to making freely available 3D computer models, images, animations and related material for the enjoyment of all. No commercial use of models or other material is permitted. Models are only re-used or ported with the permission of the originator. All alliance members wish to respect copyright in the original properties being modelled. The alliance particularly encourages joint projects between members. Such projects include the creation of virtual worlds populated by landscapes, buildings, craft and characters, and the creation of new multi-media storybooks. Provision of 3D modelling techniques and tips. Alliance members use a number of different 3D modelling and rendering packages. However, for transporting models between members, 3D Studio Release 4 (.3DS) format models with textures in JPEG (.JPG) format have been found to be most useful. All filenames for models and textures should be maintained in DOS 8.3 uppercase alphanumeric and "_" (underbar) only format for maximum portability. Star Wars Modelling Alliance - Modelling Information, Formats and Tools Page. which will contain the definitive current members list. The list below of early members is retained for interest only. Gives the full membership list. Please contact Austin Tate <a.tate@ed.ac.uk> and/or Michael Faries <mfaries@yahoo.com> at any time if you would like any details in the directory above amended or your name removed. There is a Yahoo Group used for communications between GAMMA members. Members active in the creation or use of Gerry Anderson CGI and 3D computer models may ask to join this group. Full Membership of GAMMA is open to anyone contributing to the aims of the Alliance and who provides free access to at least one appropriate computer model. The model(s) will be listed in the Gerry Anderson Models Index and your name may appear in the list of GAMMA members below (if you wish). All official material on <title> is copyright by <copyright owner>. This is fan produced material intended to promote interest in the shows of Gerry Anderson. The materials are provided for your enjoyment, but should not be used for any commercial purpose. Care has been taken to avoid the use of copyright images and other materials, but concerns over unsuitable use of materials, or suggestions for improvement of this model should be sent to <your name and e-mail address>. These models are provided as is with no warranty of any kind (of course). GAMMA Members who provide variants or ports of someone else's models must ensure they have the approval of the originator before providing the new version publicly. This may be provided already when the model was made available previously, or you may have to see the approval of the model's creator. You should always give credit to originators in the description of the model and include any copyright or restriction messages imposed by the originator. Sample image: please send an 800x600 or 640x480 JPEG image, and a 160x120 JPEG thumbnail. After being listed on this page as a member, members may use a GAMMA logo on their own pages to show their alliance. The logos may be suitable for customizing by adding a relevant and suitable craft at its head (rather than the main GAMMA Thunderbird 1). An example with Thunderbird 2 created by Andrew Stampalia. December 1995 Bruce Brachman's Fireball XL5 model posted at http://www.aiai.ed.ac.uk/~bat/GA/fireball-3D.html for all to share. January 1996 Gerry Anderson Craft Index Page created by Austin Tate at http://www.aiai.ed.ac.uk/~bat/GA/ga-craft.html to collect together information on Gerry Anderson computer models. January 1998 Austin Tate and others begin Take Two project to create a new multi-media storybook for Supercar, with a home page at http://www.aiai.ed.ac.uk/~bat/GA/TAKE2/. October 1998 Mateen Greenway, Mick Imrie, Don Showalter and Austin Tate cooperate to create Supercar and Black Rock Laboratory models and web site at http://www.aiai.ed.ac.uk/~bat/GA/supercar-3D.html to share the Supercar models and images. June 1999 Bruce Brachman, Robin Day, Mick Imrie and Austin Tate begin co-operation on a project to create additional models for the virtual Space City environment. June 1999 GAMMA formed by founder members involved in a number of cooperative projects. Initial web site created at http://www.aiai.ed.ac.uk/~bat/GA/GAMMA/. August 1999 Invitation to Gerry Anderson computer modellers represented on the Gerry Anderson Craft Index and others to participate in GAMMA. All members who joined before the start of the 21st Century (1st January 2001 for the avoidance of doubt) are called charter members. 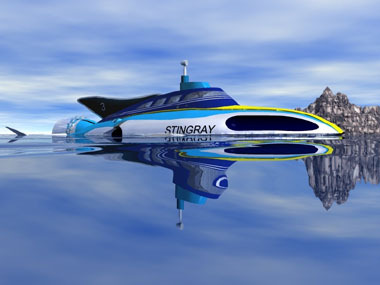 January 2001 Century 21 Project added for revised versions of Gerry Anderson Craft. August 2003 New GAMMA mirror sites established at http://www.Thunderbirdsarego.org/GAMMA and http://www.Space1999.org/GAMMA. Members FAQ undergoes revamp. Contacts: This is a fan maintained page intended to promote the shows of Gerry Anderson. Care has been taken to avoid the use of copyright images and other materials, but concerns over unsuitable use of materials, or suggestions for improvement of this page should be sent to the GAMMA webmaster.